In this episode, Part 3, we are going to address a very important question. What is more important for better cooling? A small but thick radiator or a large but slim radiator? Some already know the answer to this question, but as we said many times before, our blogs are for „all ages“, so we are going to discuss this topic. 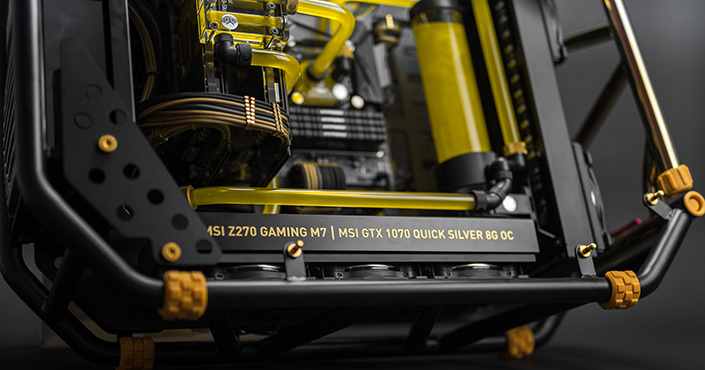 Still, if you are an experienced liquid cooling user, and you already know the answer, maybe now you have a chance to see concrete results presented in some nice charts for the first time. 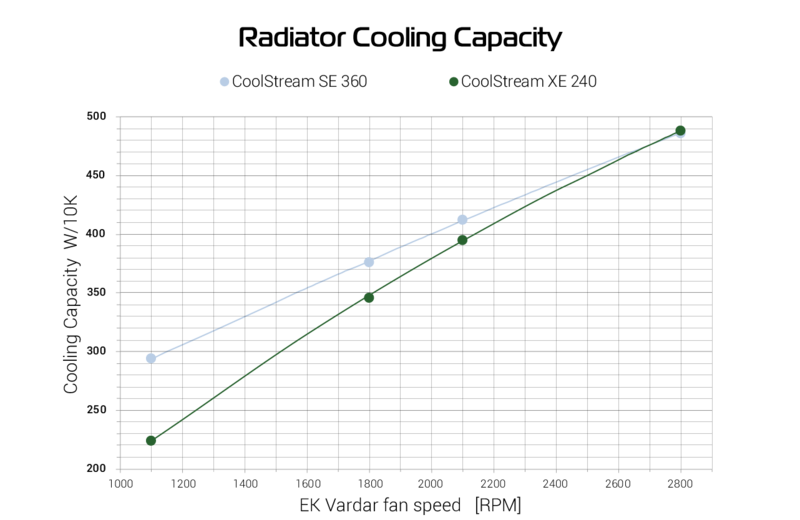 In the chart above, we can easily see how the slimmest SE 360 radiator beats the thickest XE 240 in every aspect. 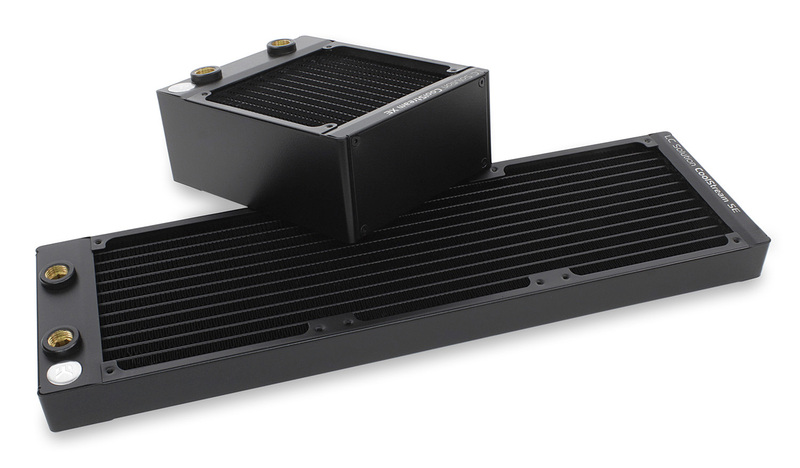 If you are after a silent liquid cooled build, and you have the option to mount a 360mm radiator, by all means, the SE 360 is the way to go. Many presume that thick radiators are packed with super-powers and will bring extreme cooling performances, but things are more complicated than that. But why is it so? In previous radiator blog posts, we already talked about how radiators work. In a push configuration, cold air is pushed in by a fan from one side of the radiator and warm air leaves at the other side of the radiator. Heat is being transferred from the liquid to the radiator fins, and onto the air that is pushed through by the fan. 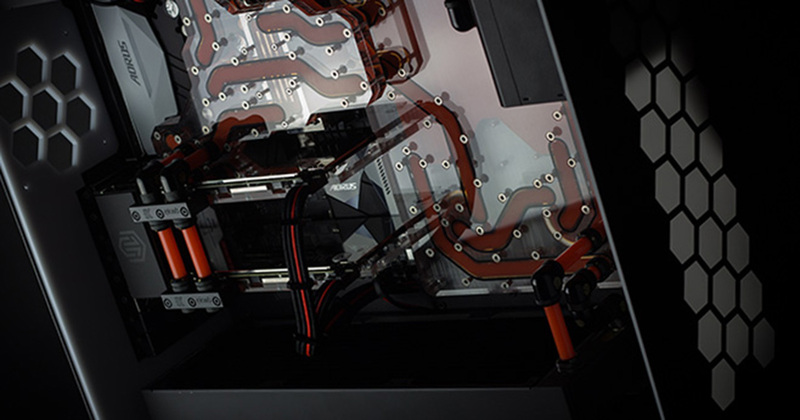 By these simple steps, heat from a CPU or GPU is leaving your PC in a form of warm air. 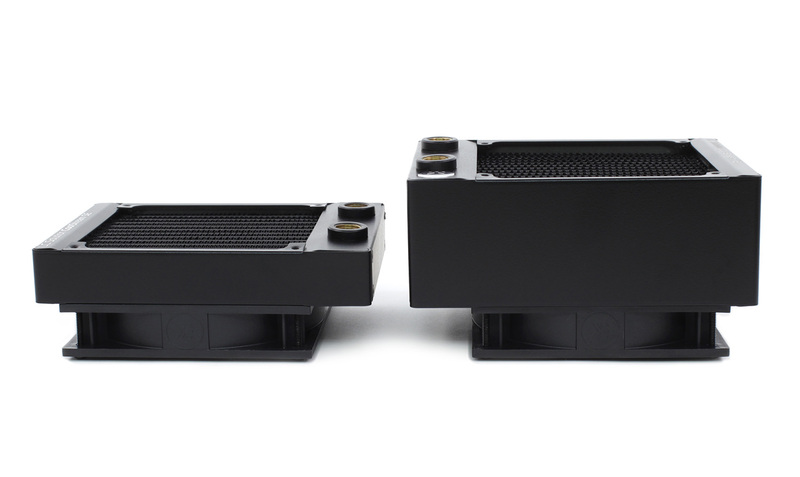 Imagine that an XE 120 60mm thick radiator is actually three slim radiators packed on top of each other. As the fins are being cooled from bottom to top, the air that passes through the radiator is being warmed up. This means that when the air reaches the third and last radiator in the imaginary stack, it’s not cool enough to provide efficient cooling. If you remember from our Radiators Part 2 blog, the greater the difference between the coolant temperature and the ambient temperature, which is the temperature of the air passing through the radiator, the better cooling performance you will have. So… by using a thick radiator, the bottom part of it, in this case, will have better cooling while the top is less efficient. Taking this „gradient“ into account, a thick radiator will have a worse performance with low fan speeds. 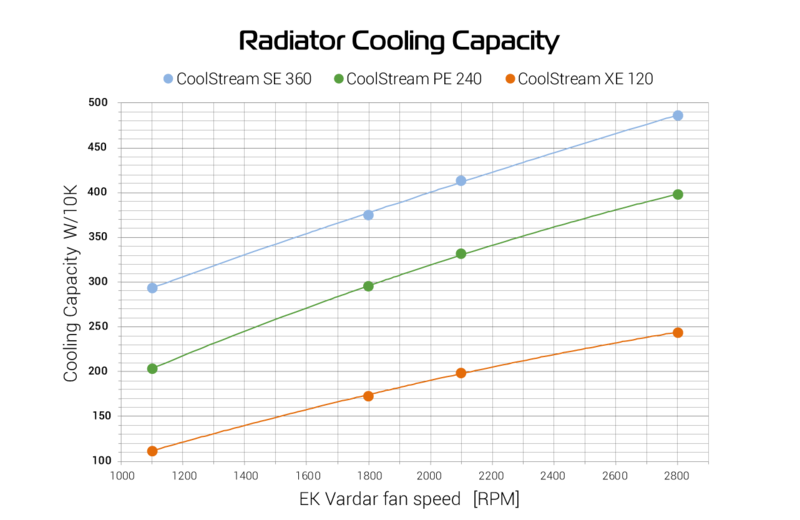 The chart above shows that the XE 240 will catch up with the slim SE 360 only if we crank up the fan speeds. Let us look at some extreme comparisons. If we compare the super thick single XE 120 with the slim triple SE 360, we will see how much advantage a bigger cooling surface has over a small thick radiator. Predictably, the PE 240 will sit in the middle of these two. Therefore, even though we can look at the XE 120 as a slim SE 360 that is chopped up and stacked in three layers, it is not even close to the slim triple radiator regarding performance. So why would anyone choose a CoolStream XE 240 instead of an SE 360? It’s simple, because of space restrictions. 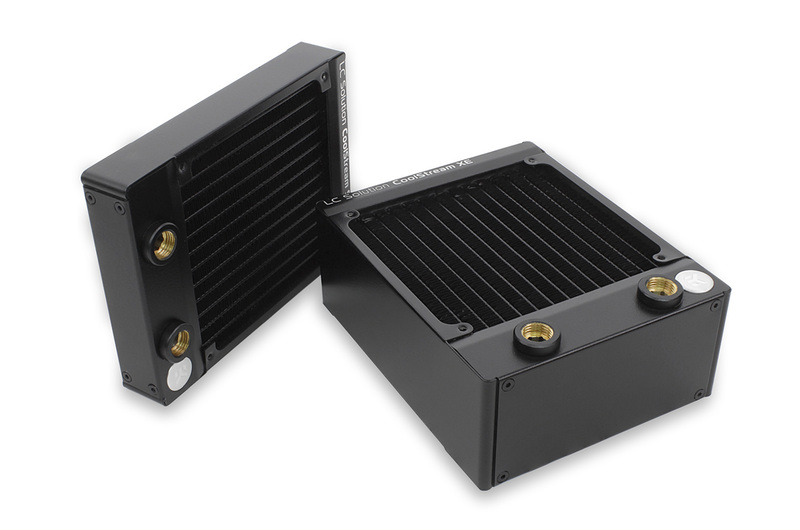 Not many cases offer support for a 360mm radiator, which is the reason why the 240mm form factor is more widespread. Of course, if you can, it’s good to spread out and get two CoolStream SE 240 Slim radiators instead of grouping your cooling into one thick radiator. But it all comes down to the personal choice and case limitations. If while reading this you got the feeling that thick radiators, like the CoolStream XE, are useless, you will just have to wait for our next “Radiators” episode where we will discuss Push, Pull and Push&Pull setups. You will like the numbers you’re going to see there. Very good blog post, very informative. So we know that a slimmer radiator that is long is better then a thicker radiator that is short but what if they’re both the same length, which one is better, a 360mm thin radiator or 360mm thick radiator? Same length, only difference is thickness. The main message here is, if you want to run your fans at a lower speed, a big slim radiator or two smaller slim radiators will perform better than one thick. Thick radiators have more cooling power, but they require faster fans to exploit that performance.